Archives of Eaton Bray News for July 2013. Central Bedfordshire Council operates No Cold Calling Zones. These are designed to give a clear message to traders and other business callers that residents in the area do not wish to receive unsolicited calls. Whilst it is not illegal for a trader to cold call, No Cold Calling Signs - which are visible throughout Central Bedfordshire - act as a deterrent to unwanted callers and help to cut doorstep crime. There is currently a hot line which can be used to report traders and businesses who are cold calling and we would like to extend the service we provide by asking residents to act as "Community Champions" who would report instances of cold calling. They could also offer advice and support to other residents and particularly to those who are vulnerable. We will provide training and information packs for volunteers and it is anticipated that the training will take place in September 2013. The scheme will be re-launched once the training has been completed. To coincide with the re-launch of the scheme we are offering signage at discounted prices and door stickers for residents within the zone to display at their premises. If you would like to order signs or stickers please contact: [email protected] or call 0300 300 8136. 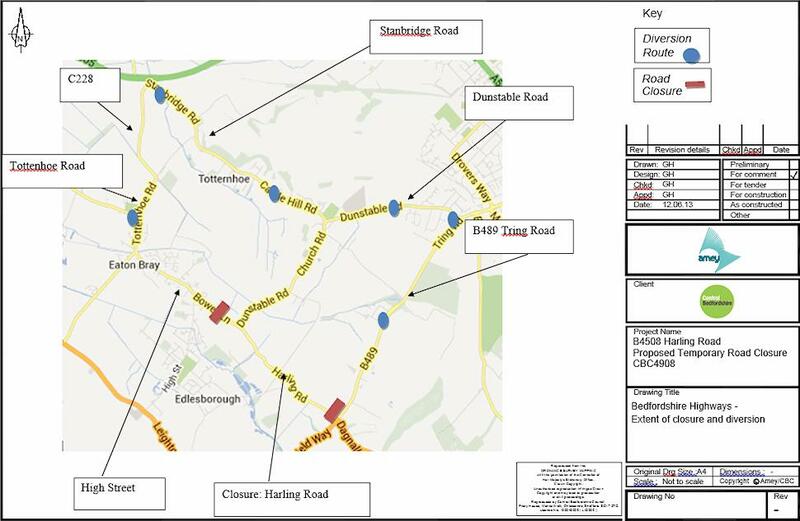 I have a request for an Emergency Road Closure at the above location to enable emergency carriageway patching works to be carried out in safety. Details are listed in the schedule below and having assessed the application I am satisfied the request is justified. The alternative route for this closure is as in the details below and will be signed accordingly. The restriction is to be in operation only when the necessary signs are erected on site. This Notice will cover a twenty one day period however the works will be limited to the date as shown below. Access may be allowed from time to time according to local signing. Date: The closure is expected to take place on Friday 26th July 2013 between the hours 0800hrs and 1800hrs. Access may be allowed from time to time according to local signing. Alternative Route: Proceed along Moor End in a southerly direction into High Street Edlesborough, at the junction turn right onto the A4146 Leighton Road, turn right onto Eaton Bray Road continuing into Northall Road, at the junction turn right onto High Street Eaton Bray and continue to Moor End junction to reach site and vice versa. NB. The applicant will be responsible for taking down all Central Bedfordshire Council public notices immediately after the works have been completed. Mindings is a service that lets people send personal, captioned photos, text messages, calendar reminders, Facebook content and much more to a digital photo frame. Mindings connects friends, families and new social networks by enabling effortless, regular, personal, and meaningful contact. It has been described as 'facebook for the technology shy'. The Council needs volunteers who are willing to use Mindings for two months and tell us about their experience. 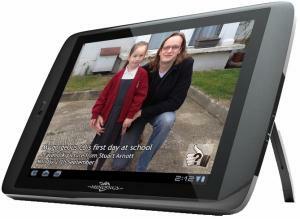 We will install the devise and show you and your family how to use it. Mindings requires an internet connection so this will be provided for the duration of the study if you don't already have one. We will contact you at the beginning, 4 weeks in and at the end of the study to talk to you about your experiences and find out what you think of Mindings. At the end of the study you will have to return the Mindings equipment but it is available for purchase if people wish to continue using it. Be able to understand and sign a simple consent form. Have lived in your current home for more than 6 months. Have family or friends who you see less than once a fortnight. Have friends and family who can send you regular updates, photos, messages and reminders depending on how you want to use Mindings. Be willing to share your experiences of Mindings with our Research Team. 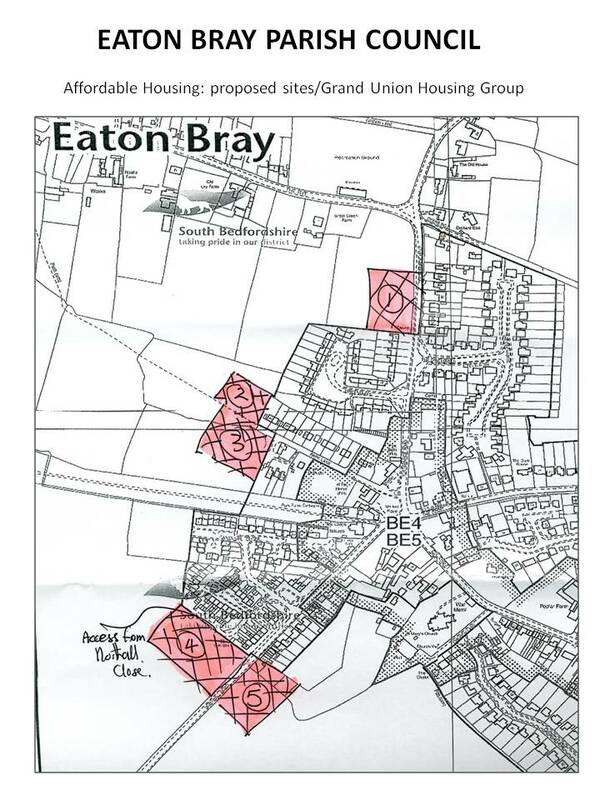 Suggestions for land for development of affordable housing were put forward by the Grand Union Housing Group at the July 2013 Parish Council meeting. A copy of the proposed locations is shown below. The council would like to gauge residents opinions on these sites, however it is important to note that the Parish Council is not endorsing these locations they are just recommended sites put forwarded by Grand Union and no decision as yet has been made. Please email/write to the Parish Clerk (contact details on the Eaton Bray Parish Council website) with your comments by end October 2013. 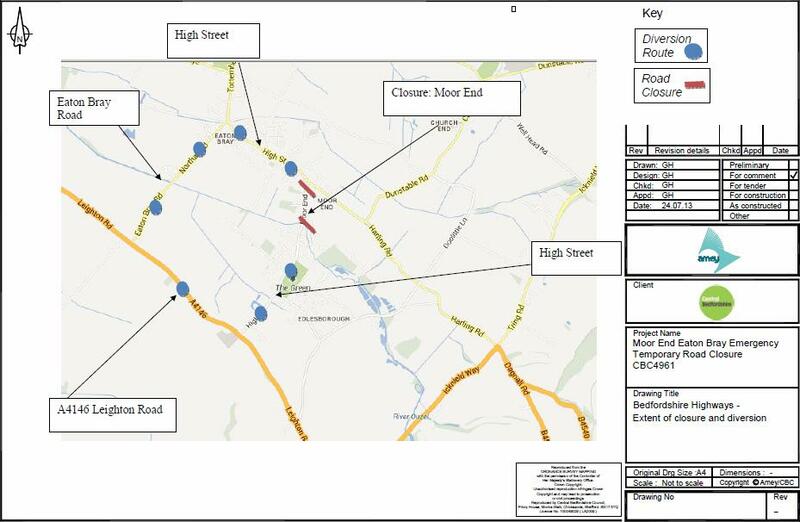 I have a request for a Temporary Road Closure at the above location to enable water main replacement works to be carried out in safety. Details are listed in the schedule below and having assessed the application I am satisfied the request is justified. The alternative route for this closure is as in the details below and will be signed accordingly. The restrictions are to be in operation only when the necessary signs are erected on site. The Legal Order will be made to cover an 18 month period. Access may be allowed from time to time according to local signing. Alternative Route: Proceed along Bower Lane in a northerly direction onto High Street and Totternhoe Road, Eaton Bray. Proceed onto C228 and take the first right turn onto Stanbridge Road, continuing on Castle Hill Road and then Dunstable Road to the mini roundabout. Take third exit onto B489 Tring Road and continue to the roundabout to reach Harling Road and vice versa. As you know it's quite warm at the moment... we are currently at a Level 2 Heatwave Alert, which means that a Heatwave is forecast. For the East of England there is an 80% of Heatwave temperatures being reached (full warning attached). 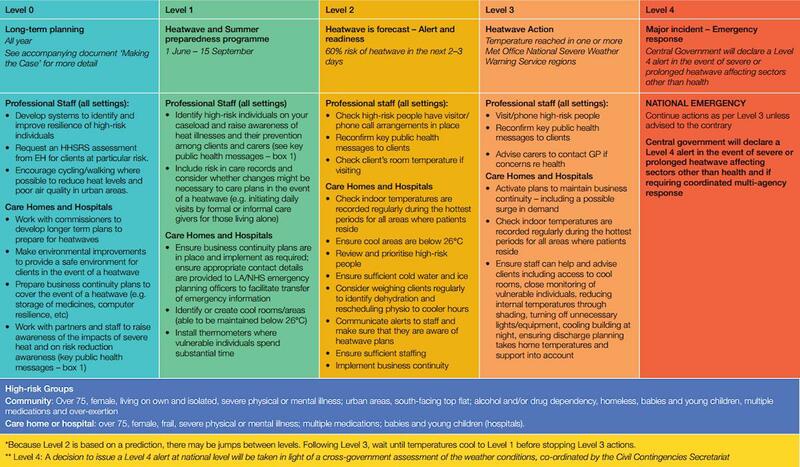 In the Heatwave Plan for England 2013 there are a specific set of actions for Voluntary organisations and our Community Emergency Teams to take - these are in summary below. A resident in Bedfordshire has contacted us to report a suspicious telephone call. The company called, claiming to be working with the Police in the local area providing crime reduction products. The caller tried to make an appointment to visit the home and asked a number of questions about the resident and who else lived in the house. The resident became suspicious of the caller and refused to provide any personal details, or to make an appointment. Bedfordshire Police do not employ any private companies to undertake home security surveys. If you have concerns about your home security you can speak to a Crime Reduction Officer by calling 101. Do not disclose personal details over the phone. If you wish to purchase home security products always get at least three written quotes from registered companies. Check with your local Trading Standard Approved Traders list. Ask friends and neighbours to recommend a suitable company. Never agree to buy goods or services as a result of a cold call to your home. If you are interested, ask for them to send you details so that you have time to consider before making a purchase. If you make an appointment for someone to visit, arrange for a friend or family member to be with you when they call. Do not pay for work until it has been completed to an acceptable standard. The next Parish Council meeting will be held on Monday 2nd September 2013, from 7.30pm, in the Coffee Tavern. ... it's that time of year when the Edlesbray Players think about the January pantomime. The Pantomime Guild of Baddies think they have come up with the ultimate plan to ensure they dominate the world. They pitch representatives of each Panto against one another in a series of bizarre and entertaining games. It looks like only one Panto will survive! Will our heroes work out that by joining together, the Guild of Baddies can be defeated? If you'd like to join in The Panto Games, auditions will take place locally on the evening of Monday, 16th September. And if you don't want to act, you can still play your part and join in the fun. Help is always needed behind the scenes – design, carpentry, painting, sewing, admin, etc – as much or as little as you can commit. Please contact Bekka via the Edlesbray Players website for more information. 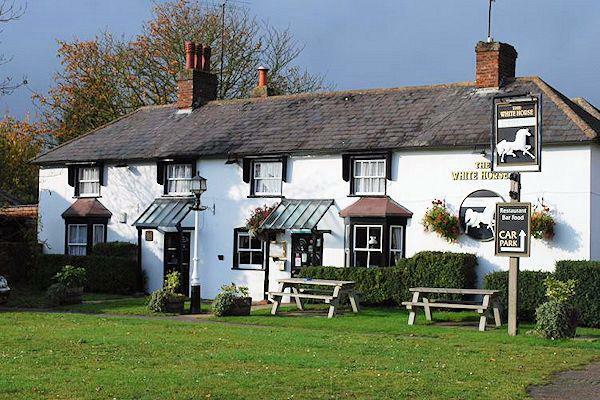 The White Horse is now fully open after being closed for extensive maintenance and considerable refurbishment during part of June. We are of course sorry for any inconvenience this may have caused but hope our customers feel that the result was worth the wait. You are viewing the July 2013 archive.